A Dental crown is a cap that sits over the top of the tooth creating a tooth surface to protect, cover, seal and strengthen your tooth. 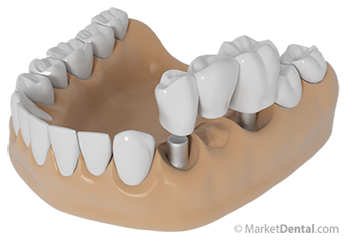 Dental crowns are used in many different scenarios as they are effective and often allow us to save a tooth rather than turning to implants. Larger fillings that have broken down or have formed decay around them may need a dental crown to save the tooth. Teeth that are very sensitive either from a lot of “wear”, or from receded gums, sometimes require dental crowns to seal and protect the teeth from hot and cold sensitivity. A tooth that has broken may be too weak to hold a filling. A crown will hold the tooth together and prevent it from breaking again. If the fracture is too deep, Root Canal Therapy may be required before the tooth is crowned. A tooth that has undergone Root Canal Therapy will need a crown to adequately seal and protect the tooth. A dental crown may be the solution to saving that tooth; our Yonge and Eglinton Dentists will evaluate your needs depending on your oral health and the condition of your teeth. A dental bridge is a false tooth that can be used to replace one or more missing teeth. Dental Bridges can do many things, including reducing your risk of gum disease, help to correct minor bite issues and can even improve your speech. The false tooth acts as place holder to avoid the shifting of other teeth, improve/maintain your oral health as well as protect the appearance of your smile. If you’re missing a tooth and have figured it was harmless until now, ask us if a dental bridge is right for you. At Dayan Dentistry, we're pleased to offer various options for dental bridges to fill missing teeth gaps. If you are looking for an experienced dentist in Toronto for dental bridges, please give Dayan Dentistry a call at (416) 322-3233 to schedule a consultation with our dentist.